Exercise and dieting alone don’t always give us our desired results. While there are surgical options to further tone and tighten the body, non-invasive procedures to reduce fat cells are becoming increasingly popular. Freezing body sculpting allows you to attain a contoured and shaped body with very low risk. There are several benefits and tips to know when considering this globally-performed procedure. Keep these important facts about freezing body sculpting in mind if you’re considering the treatment. It uses freezing temperatures to kill fat cells. In this procedure, a device suctions the skin surrounding the area of fat and then cools the section to destroy the fat underneath. Your body will then naturally eliminate those cells in the following weeks. This process paired with the cool temperatures should permanently remove the frozen fat cells from your skin. The treatment method varies for each patient. No person has the same body structure and shape. The number of sessions a patient needs can vary based on the number of areas being treated and the amount of fat being targeted. Consult with the professional administering the treatment to determine how many sessions you’ll need to achieve your desired results. It treats most parts of the body. Almost any area of the body can be sculpted using this procedure. The most common areas people choose to treat are the hips, love handles, stomach, and thighs. Many people opt for freezing body sculpting because unlike exercising, it allows you to target tricky spots and problem areas. Since the procedure is nonsurgical, there is no extensive downtime afterward. In surgical operations, you must be put under general anesthesia, face risks of infection, and even potentially deal with scars left on the body. With freezing body sculpting, clients don’t have to worry about any of the complications and nuances associated with surgery. Treatments are quick and painless. The cool sensation often leads to numbing effects that may be slightly uncomfortable, but should never be painful. 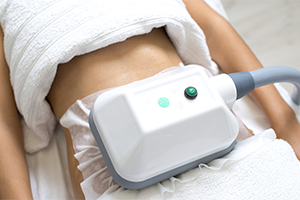 The duration of these effects can range from thirty minutes to an hour depending on the size of the treated area. The minimal downtime makes the treatment much less of a time commitment than traditional surgical methods. There may be minor side effects. Afterward, you may experience minimal redness, swelling, or bruising in the treated area from the suction process. Numbness and the feeling of nerves falling asleep can occur for hours, and sometimes weeks later. Freezing body sculpting is used for mild improvements. Freezing body sculpting will not shed pounds like liposuction, which removes about ten times the fat. The process works best and delivers the most noticeable results for those with an average body mass index (BMI). While your happiness with the results of your treatment is completely subjective, keep in mind that the process offers gradual changes and is not an immediate body makeover. You must maintain a healthy lifestyle to keep the results. The procedure does permanently destroy fat cells, but the remaining cells can still increase in size if you gain weight. To help facilitate lasting results, you’ll need to keep up with a healthy diet and exercise routine. Interested in learning more or booking an appointment? Contact the Dallas Endermologie team to speak with an aesthetician today.